Zero net emissions for data centres and other business. Microsoft has released a handbook detailing its process for becoming a carbon-neutral organisation, focusing on offsetting the cost of pollution rather than introducing emission caps and trading in credits. 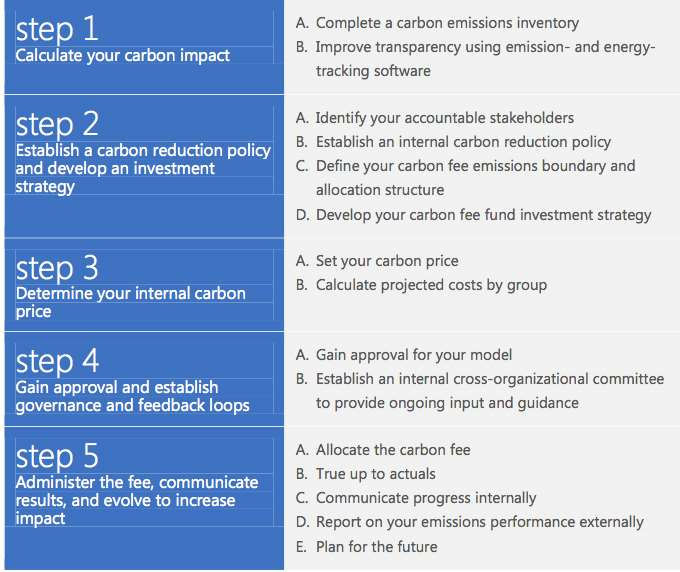 The Carbon Fee Playbook [PDF] provides an overview of Microsoft's approach to reaching carbon-neutrality through the introduction of a carbon fee for its business divisions. The company pledged last year [PDF] to make its entire operations carbon neutral. This would entail zero net emissions for data centres and other parts of the business, a difficult premise for a company that is a large consumer of energy. To achieve this, Microsoft set an annual internal carbon price that is used to calculate a fee including not just the energy use cost but also the charge to offset the emissions and pollutions associated with the activity. The carbon fee is then used to allocate the cost of reducing and offsetting emissions from Microsoft's data centres, software development labs, offices, and business air travel to the divisions that are responsible for consuming the resources. For Microsoft, an internal carbon fee helps the company address risks caused by rising energy costs and also aligns business activities with its code of ethics. External pressure from governments worldwide - including Australia, which requires companies to comply with emission mandates - means Microsoft and other tech companies need to account for and report on their carbon footprint. The company's environmental sustainability team manages the carbon fee model which in the current fiscal year has been allocted to 14 divisions in over 100 countries, Microsoft said.